Many of you know, that in addition to being Channel Engagement Innovator at HMI, I’m a past President of Mid-Day Toastmasters. Toastmasters is the best networking and professional development organization I’ve ever experienced. A couple of weeks ago, I attended Columbus OH’s Mid-Day Toastmasters Club 50th Anniversary and Holiday Celebration. I credit the Mid-Day Club and the people involved with it for much of my advancement in life and for helping me to see the world in a different way. Just as important as the communication and leadership tracks are the people and ideas to which I’ve been exposed. Surely Move the Channel or TribeVest wouldn’t exist if it weren’t for the Toastmasters platform and Mid-Day mentors and peers like Tracy Austin, Anthony Iannarino, Tommy Costantiello, Mike Rudd, Mike Brickey, Robin Starr, Wayne Harer—and the list goes on and on. Basically, there is nothing quite like the right Toastmasters club. One of the mentors I mentioned above is Tommy C. Tommy is a highly-respected financial advisor at Consus Wealth Management Group … so it probably comes as no surprise that he also loves to compete at just about everything—including Toastmaster speeches! He’s one of those guys who makes a decision and then sets his mind firmly to it. For example, Tommy had never run more than five miles at a time and didn’t even know how to swim when he made it his goal to compete in Hawaii’s Ironman World Championship. 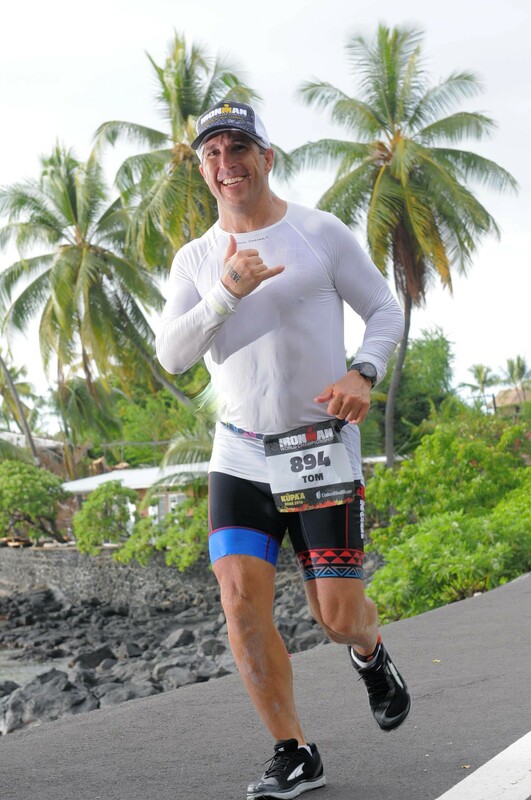 Well, fast-forward 6 years later and Tommy has successfully completed 14 Ironman Finishes, 2015 Ironman All World Athlete, and Ironman World Championship Finisher. In one year he ran a 50K, 50 miler, 100K, and 100-mile ultra-marathon. When I first joined the Toastmaster’s club, Tommy agreed to be my mentor and was a big influence on my professional and personal career. Seeing Tommy at the Mid-Day toastmaster’s 50-year anniversary was a chance to show my gratitude and to share my exciting initiatives that are ongoing at the moment with him (many of which he’s influenced). But when I finally ran into him at the party he flipped the script! He thanked me for a note that I’d written, and at first, I have to admit, I didn’t remember which note he was talking about. (Believe it or not, I do make a daily habit of writing notes of gratitude to people who have influenced me over the years). But I responded by telling Tommy that I felt it was important for him to know the impact he’s had on me, and how he’s continued to inspire me over the years. He kindly replied by saying I do the same for him, and then he told me something that shocked me. Apparently, the note that he was referring to, the one that I sent him a couple of years ago, now sits in his trophy case with other prized items representing his hard work and accomplishments. At first, I thought he was joking, because it hardly seems appropriate that a note that took me 10 minutes to write and less than a dollar to send would be sharing a spot with a trophy that required thousands of hours of training and sacrifice, years of extreme dieting, and ultimately a grueling 15-hour endurance test through rugged mountains. But Tommy assured me that it was there, and that note was a reminder that the time he invested in me as a mentee was as valuable as the time he’d invested in his many other accomplishments. It’s always a great feeling when people let me know how much they appreciate my notes. But this Trophy case story, I thought might motivate others to take the time to write a note to those who have impacted you. When was the last time you wrote a note to someone who’s impacted your life in a positive way? Does your channel partner deserve a note (a hand-written) of gratitude? Give it a try—you might be surprised at the response. Oh, and if you’re thinking about checking out a Toastmasters Club in your town, I’d be happy to share my experiences and insight with you. Feel free to give me a call.